This week is the start of the Fortnite week seven challenges for season eight. This fresh set of challenges revolves around that same pirate theme that is at the heart of Battle Royale season eight and is the first week in a while to dive into it since the buried treasure challenge a few weeks back. Unfortunately, though, that doesn’t mean the challenges are great for this week. They’re actually pretty lame. The season eight, week seven challenges are probably one of the worst sets of challenges this entire season. They’re all pretty lame challenges that we have seen a million times before. Even the best pirate-themed challenge this week is just a slight rework of a challenge we already did at the very beginning of the season. As always, there are a total of seven new challenges for players to take on this week. Of those challenges, three of them are available to all players regardless of owning the season pass or not. However, the four other ones are only for players who own the Battle Pass for this season, which you might have gotten for free if you did the overtime challenges last season. If you want to know what all seven challenges are, check out our handy dandy screenshot above. 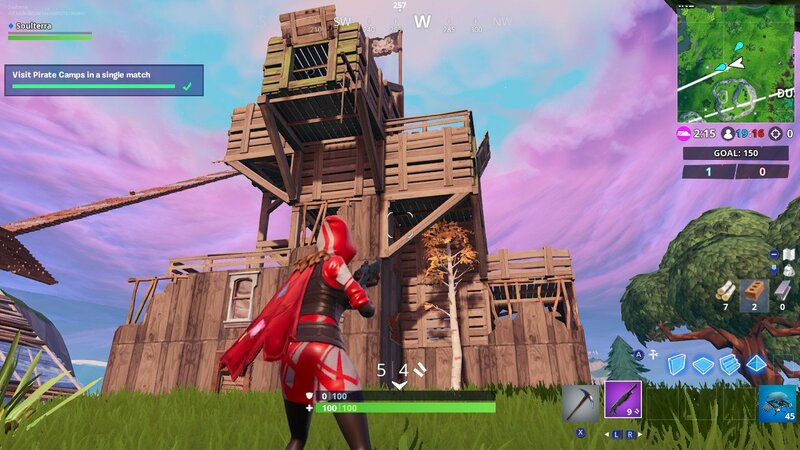 As for the big challenge this week, it’s a simple one that might look familiar to diligent season eight Battle Royale players. The task is to find and visit three different pirate camps on the map but the catch is that you must visit all three of them within the same exact match. This makes this otherwise simple challenge a much more difficult one. Luckily, we have all the locations of the pirate camps on the map as well as some important tips for completing this challenge. First and foremost, you will absolutely need to do this challenge in Team Rumble or one of the big team modes. This is because it gives you ample amount of time to find all three before the storm completely closes in. In addition, there are respawns so if you are killed by an enemy while you are doing the challenge, you won’t lose all progress. Another reason why you should do it in Team Rumble is that the teams are much larger than usual but there are still fewer players in total and fewer enemies to worry about than in other modes. You will also want to find a vehicle like the new Baller so that you can quickly zip around the map and reach all three pirate camps in time before it’s too late. If you can’t find a vehicle, be sure to stock up on building resources along the way so you can build yourself a ramp, jump, and deploy your parachute to travel more quickly across the map. Alternatively, you can also make use of the volcano vents, like the one seen above, to boost you quickly into the air. Those vents were the only reason we were able to visit the third location before the circle closed in completely. Last but not least, make sure to turn on Party Assist mode in the challenges tab of the main menu so your teammates can help you do this challenge, too. Let’s go over the three pirate camps that we recommend you visit for this season eight, week seven challenge. These three locations are closest together so it’s not as hard to visit them in a single match of Team Rumble. The first location up is near Lazy Lagoon. If your battle bus gives you the chance to land here first, we highly recommend you do so. This is because there are some Baller vehicles you can find at the fort or in an area nearby that you can use to get to the other locations. However, it is a popular spot so you might not make it to the vehicles before your teammates do, which was the case for us. The exact location of this particular pirate camp can be found just to the west and slightly northwest of Lazy Lagoon. It is northwest of the huge pirate ship and the little town in Lazy Lagoon. Its location on the grid map is right on the border of the E2 and F2 squares. Head here and get close enough to the camp so that you see a notification pop up in the top left corner of your screen, letting you know that you’ve reached the pirate camp. Now, grab a Baller if there are any left and start heading southeast. For the second pirate camp, head directly southeast from Lazy Lagoon. 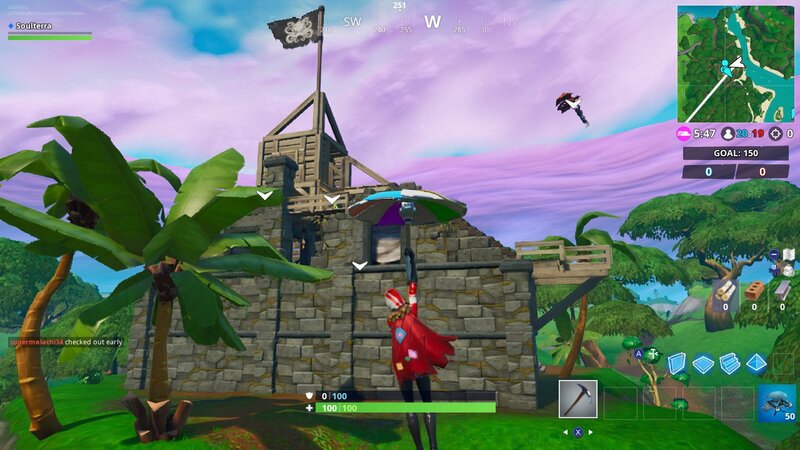 This pirate camp is located right near the base of the unnamed volcano location. It is a bit of a walk, which is why building a ramp or using a vehicle will do you a lot of good here. You will need to go past the town in Lazy Lagoon all the way to the west side of the volcano. The exact location of this volcano pirate camp is just southwest of the main volcano itself. It is also north and west of the lava river that flows from the volcano. You can see this pirate camp’s little mark on the main map. If you’re looking at the grid map, it can be found on the border of the G4 and H4 squares. Once you arrive at this location, get close enough so that you can see the notification. Now, it’s time to head to the third and final pirate camp that we recommend you visit. Thankfully, the volcano pirate camp is on a steep cliffside you can easily jump off of and glide for a bit. Face southwest towards Dusty Divot and let’s head to the final location for this challenge. 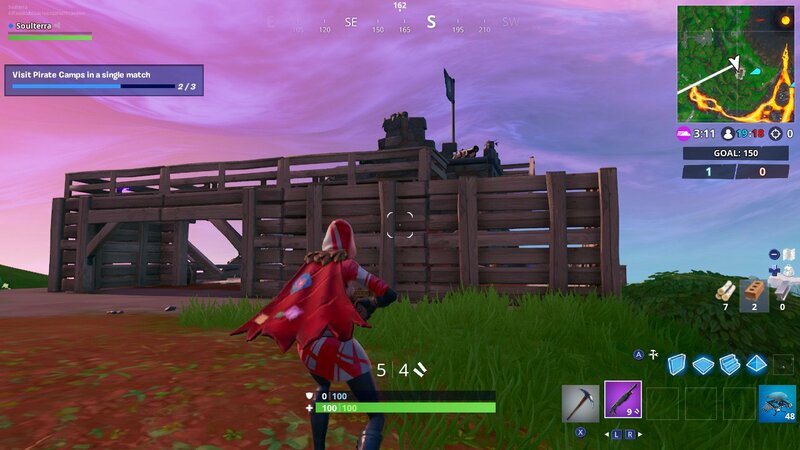 The third and final location we recommend you visit is the Dusty Divot pirate camp which is just southwest of the previous one. 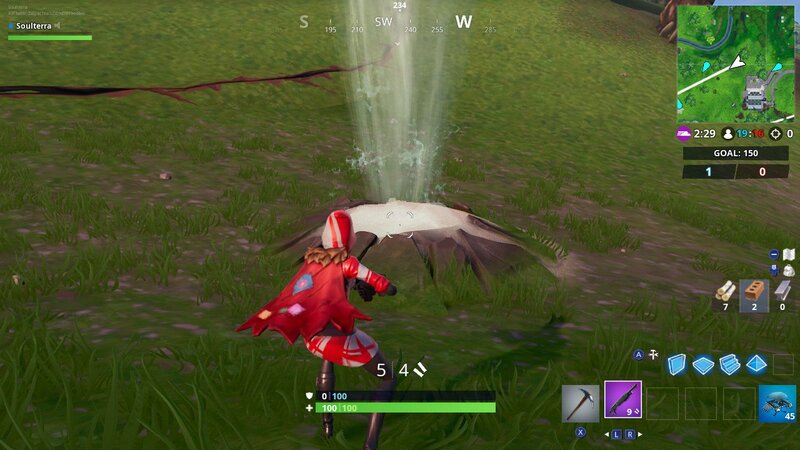 Its exact location is ever so slightly northwest of Dusty Divot itself and directly north of the big hill in the middle of the island. You can also see this pirate camp on the map as it is massive in size. If you’re looking at the grid map, you can find this camp right on the border of the E5 and F5 squares. Head here and get close enough so that you see the notification. Pleasant Park: Located slightly southwest of Pleasant Park and below the huge mountain near there. You can find it in the B4 square. 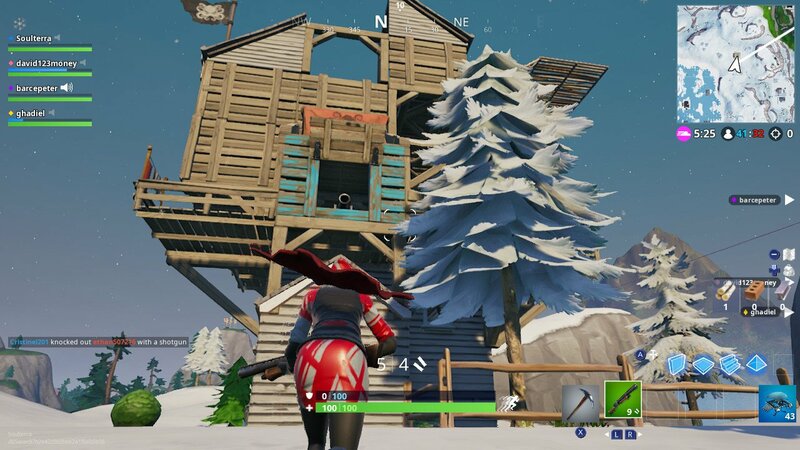 Tilted Towers: Southwest of Tilted Towers and in the snowy biome. It can be found in the C6 square. Salty Springs/Fatal Fields: Southwest of Salty Springs and northeast of Fatal Fields. It’s right on top of the huge hill here that you can’t miss. Paradise Palms: Northwest of Paradise Palms in the desert. It’s located right on the border of the desert and grassy areas in the H7 square on the map. 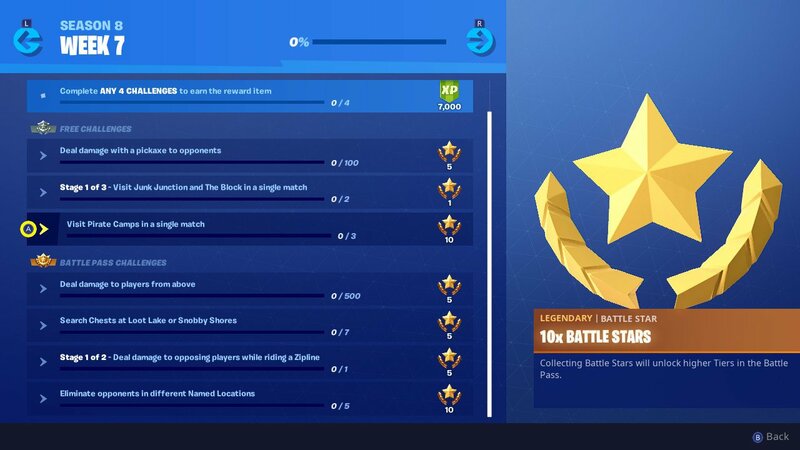 Your reward for completing this season eight, week seven challenge is 10 whopping Battle Stars. That’s enough to guarantee an entire tier level up so don’t miss out on this reward.